Having lived vicariously through my kids travels, I decided it was my time to do some traveling. Our first experience was “flying across the pond” to do a river cruise. Everything was so new to me and I was anxious to do more. The travel bug had bitten me – really hard and right near my heart. All I could think about was making my bucket list and prioritizing where I wanted to go. I had to find a way to make my dreams come true on a limited income. This blog is about my journey fulfilling that dream. It may not be on a shoe string budget but it is cost conscious. Tips on maximizing your experiences while minimizing the costs, using credit card sign-up bonuses, manufacturered spending to give you more points, and shopping bonus categories for 5 times points….all this will be written about so that a beginner can understand. 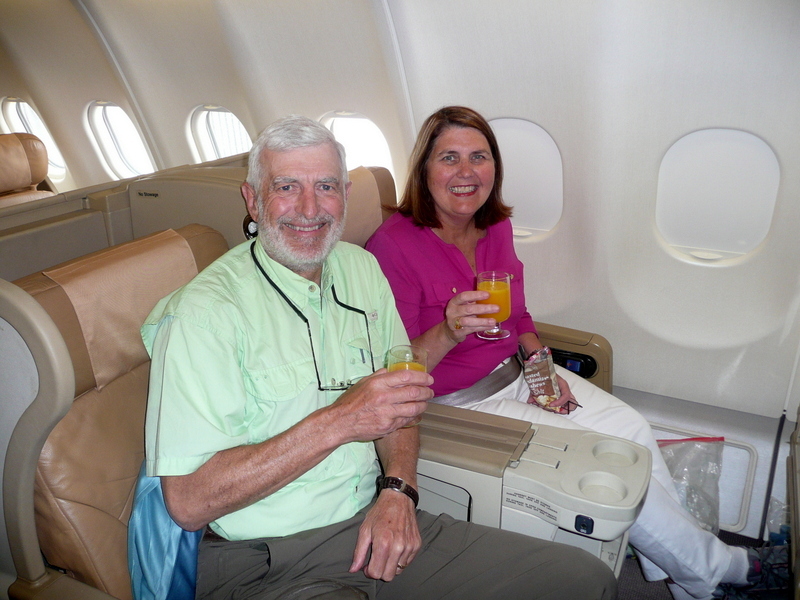 Blogger Hubby and I are a retired couple on a fixed income so we are cost conscious about all of our travels but at the same time I want a millionaire’s (well, maybe a thousandaire’s) vacation. I don’t want to stay at the cheapo hotels and fly coach across the Pacific from the East Coast but I will fly economy across the Atlantic to save my miles. That is what started my interested in points – a way of maximizing my vacations through points and miles. Since this blog is about air, land and sea I will be writing about road trips, hotels stays even a few note worthy restaurants along with airlines, and cruises. Monet’s garden is just a dream come true, isn;t it? I was so happy to see you mentioned my book Monet’s Angels. Much appreciated. I hope you enjoyed it. I like your blog, I find you are somehow like me. Although I have a very young child and am 25 years away from retirement I find you really down to earth. My income is also very limited and I am the only one in the household with good credit so I have to be very strategic to get miles. i don’t care about expensive hotels, I like airbnb and I’m a host myself so…. thanks for this blog about simple traveling! Jane, I notice you’ve been to Asia and would like some assistance. I got into miles and points about 18 months ago when I realized I had a new grandson and a wedding coming up. It’s been grand, but I only know about the US!! My d-i-law is from the Philippines and she and her family want to go there to visit family, and she’s asked for help. I don’t even know where to start for the Philippines! All that came up in my Google search were travelogues, not “best airlines, credit cards, and ways to accumulate points and miles. Can you give me some resources, bloggers, and advice to start learning about this?? I would appreciate it so very much!!! I love your blog; it’s down to earth and practical, like the way I like to travel. This is Allison Bornarth, now Bredbenner. I just found your blog yesterday via Lisa and it is great! I read the full archive in one sitting. Since I started traveling I have been really curious about how to maximize reward points, and your posts are really helpful. I will probably have some questions coming your way, but for now just wanted to say hello and congrats on a great blog!